Please help stop Frankfort City Council’s ongoing effort to create an ordinance banning electric skateboards citywide. I’m asking for your help to spread the news about the Frankfort City Council’s ongoing effort to create an ordinance banning electric skateboards citywide based on the potential for a public safety problem. More information is available at the Region 7 website. 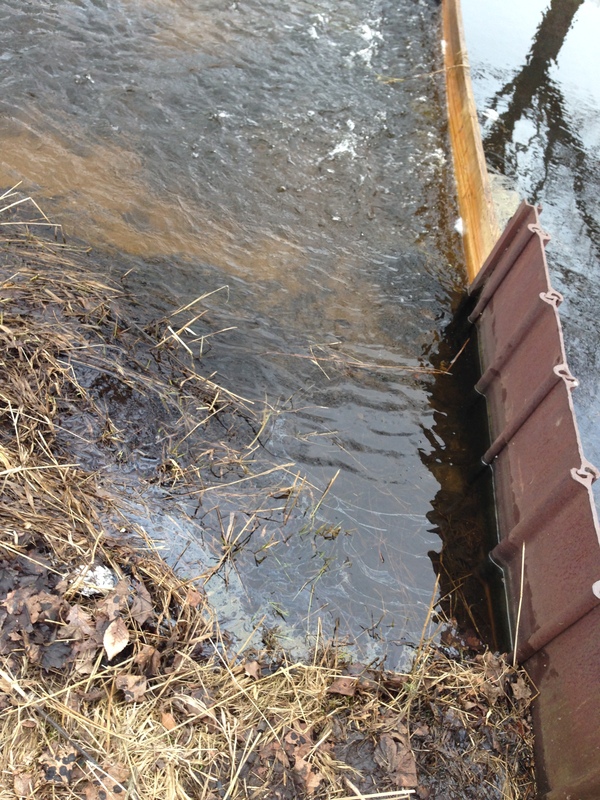 Volume of water moving through outlet is reduced, shore line lowered. Sheen still present. Sheen still present, note center blob appeared just before this picture was taken. Sheen oozing up from submerged shore continues to be flushed through the outlet. 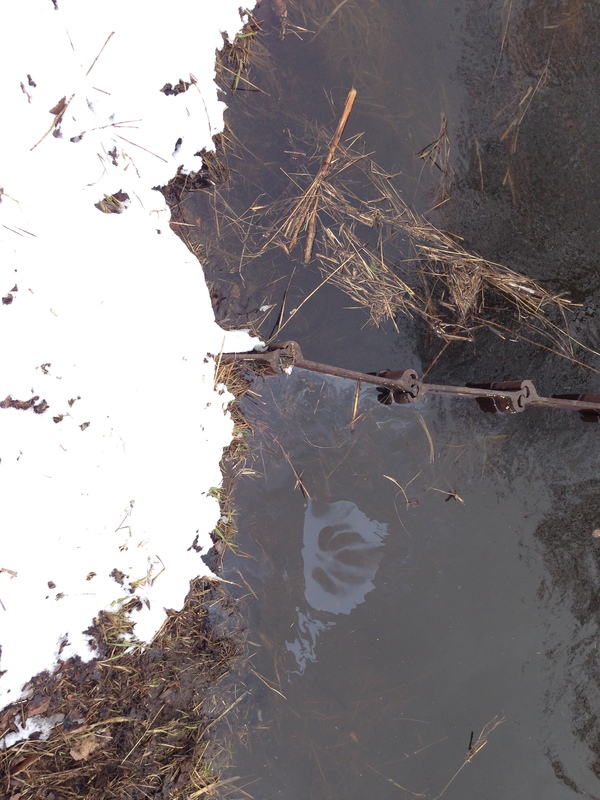 A significant amount of water was moving through the pond as the inlet and outlet boards had been removed. With the high volume of water, residual sheen from a hydraulic fluid leak should have been flushed to the booms or downstream. Sheen seemed to be percolating up along the shore, upstream of the outlet water control structure. 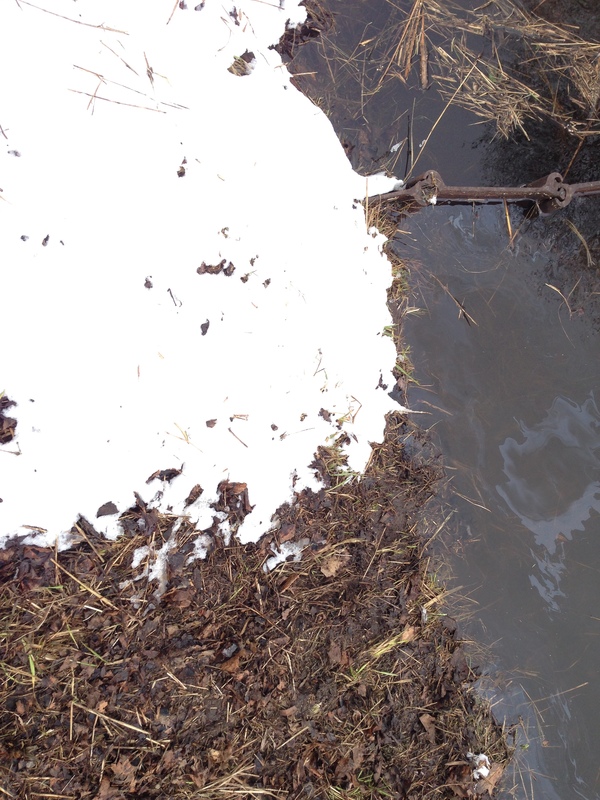 Could the increased water flow be pulling material out of the soil? 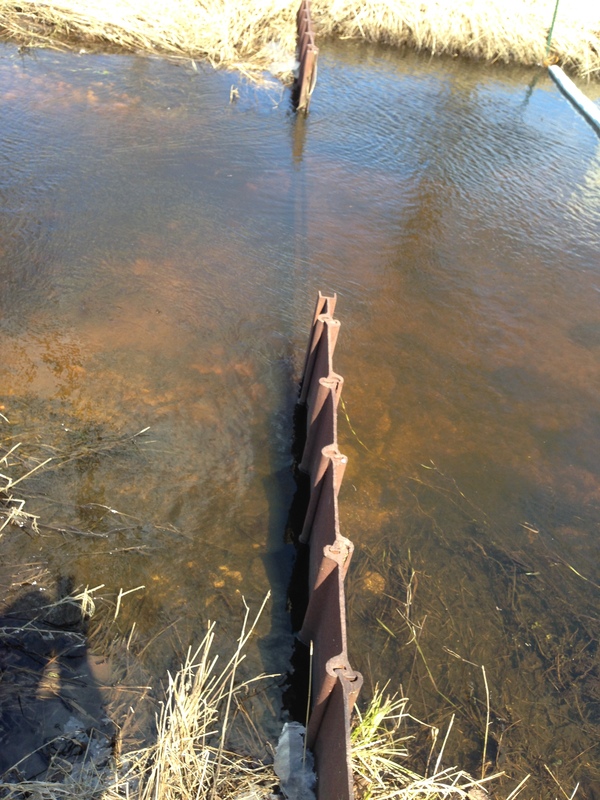 Dan Hook, Village of Beulah reported by phone that two boards have been removed from the outlet water control structure and that the sheen seems to be significantly reduced. Current pictures should be posted tonight or early tomorrow morning. As of 11:25 pm, with removal of the first board from the inlet and outlet water control structures and the resulting increased water flow through the pond, there is still sheen on the surface, possibly more than before the boards were removed. Read yesterday’s update below for implications. Photos by Dan Kelly. 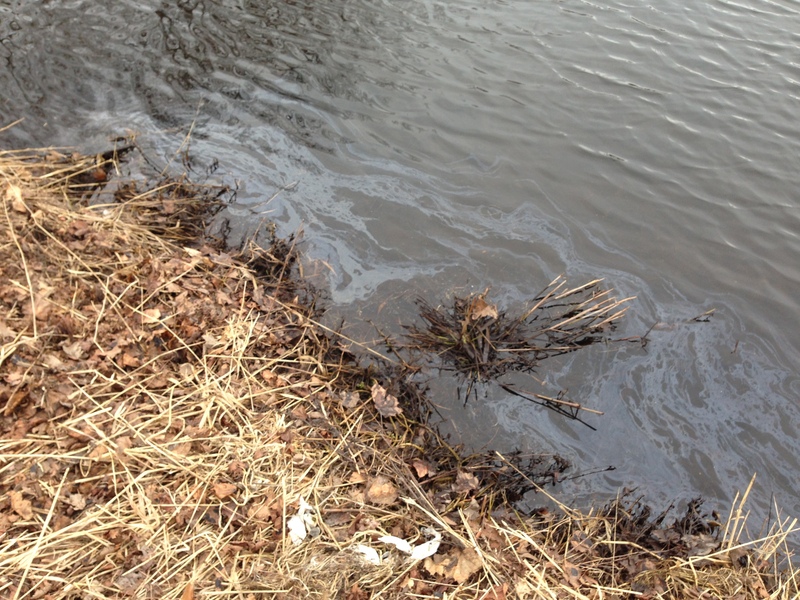 On Sunday April 6, 2014, a chemical / oil sheen was seen flowing into Crystal Lake from the Cold Creek settling pond. The Michigan Department of Environmental Quality (DEQ) issued a draft report on April 7, which provides an overview of the situation. Until the situation is resolved, find ongoing updates and answers to frequently asked questions here. Who is the dredging contractor? The Village of Beulah’s dredging contractor is Biotech Agronomics of Beulah, and the company representative is Kevin Bonney. The DEQ took water samples, why aren’t the samples being tested to determine exactly what the chemical / oil is? Wouldn’t that help identify the source? The DEQ’s priority is to determine the appropriate response, which may or may not require the samples or source to be immediately identified. The first phase was to have the contractor deploy oil absorbent booms. 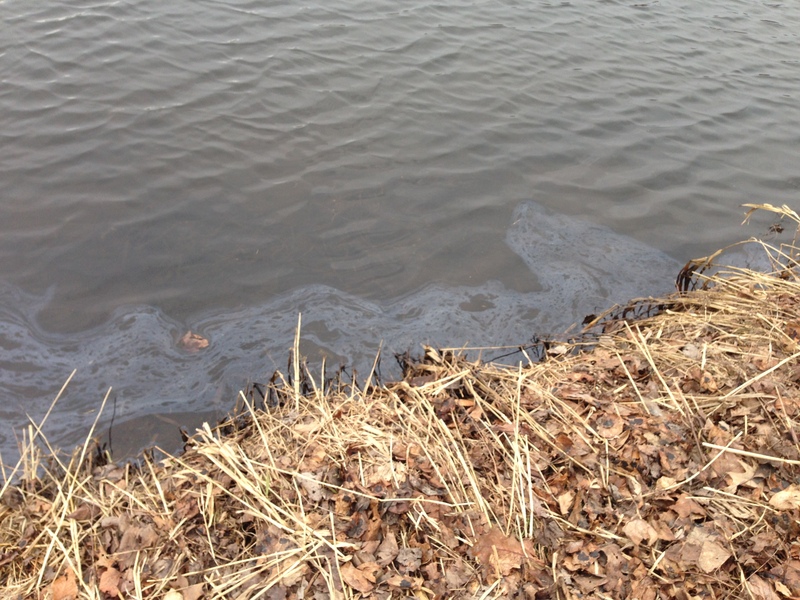 Preliminary inspection of the sheen samples by Greg Goundy on site and by his colleagues at the DEQ Cadillac office suggested that the sheen could be either diesel fuel or hydraulic fluid. The dredging barge did not appear to be leaking hydraulic fluid into the pond, but Kevin Bonney stated that there had been a hydraulic fluid issue prior to the barge’s launch, so the next phase was to remove the barge from the pond. If the sheen disappears, removing the barge was the correct response and analysis of the sample is not needed – the sheen was hydraulic fluid. If the sheen persists, then the barge was probably not the source and the samples might then be analyzed to provide further clues. Unfortunately sample analysis is expensive and may not provide enough data to identify exactly what the sheen is. If the sheen is not hydraulic fluid from the barge, what is it? 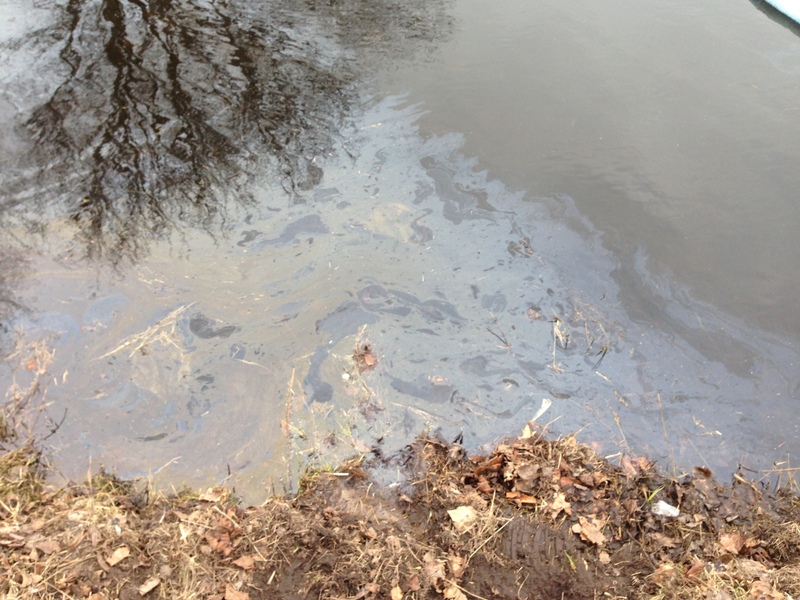 The sheen could be 1) an oil related consumer product discarded in or near the pond, eg used oil filter or mostly empty quart oil bottle, 2) legacy contamination from 20th century industrial activity (eg trains, fuel depot) migrating towards the pond through ground water, 3) other. Is there still a sheen on the pond? 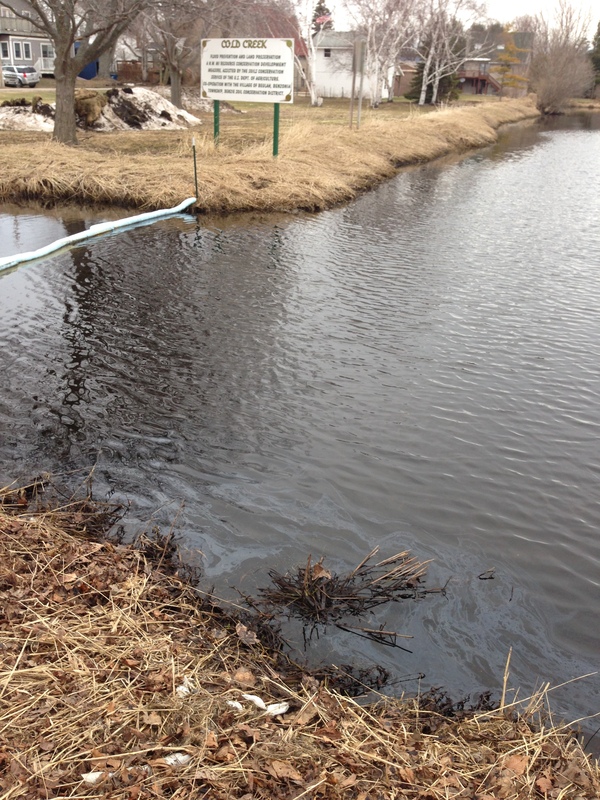 Yes, as of 3:00 PM April 11, there was a sheen on the south edge of the pond, west against the stop logs (boards) of the outlet water level control structures and swirling just downstream of the outlet water control structures. The barge was removed on the afternoon of April 10. The Michigan Department of Natural Resources (DNR) requires that the boards be removed from the inlet and outlet water control structures so that fish can travel up Cold Creek. With the consent of the DEQ, the boards will gradually be removed by the contractor, starting at approximately 9:00 am on April 12. 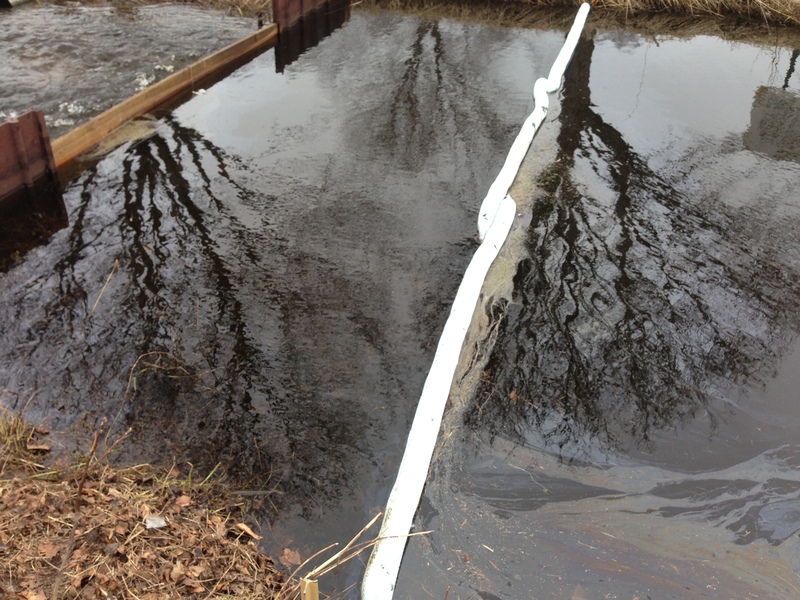 Oil absorbent booms will remain to catch sheen pulled downstream by the increased flow. Changing flow could effect the situation. If the sheen seems to persist or grow during the day, the barge may not have been the source and further action will be required. Citizens are encouraged to visit the pond and monitor the sheen during the day. Check out these Facebook profiles for pix, comments and movies. 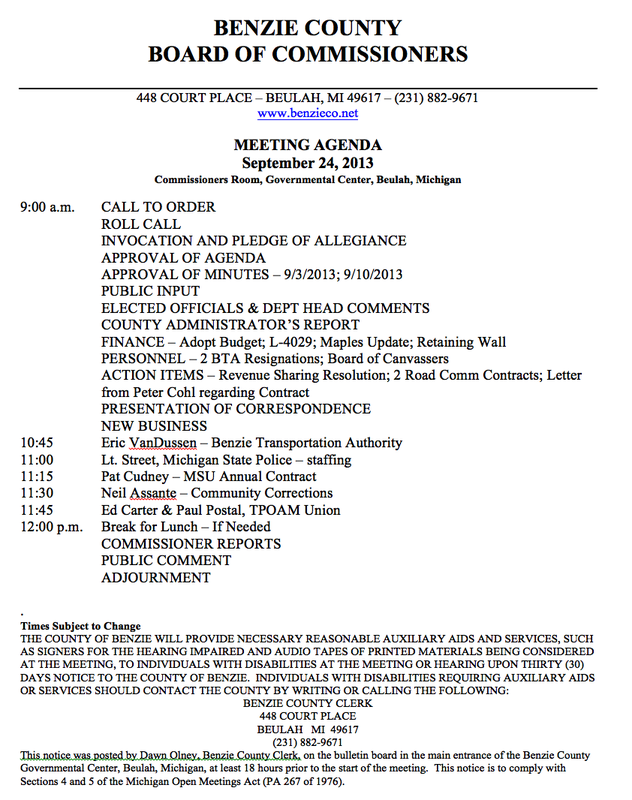 The Benzie County Board of Commissioners met in a regular meeting on Tuesday, November 5, 2013, 448 Court Place, Government Center, Beulah, Michigan. The meeting was called to order by Chairman Donald Tanner at 9:00 a.m. The invocation was given by Commissioner Kelley followed by the pledge of allegiance. Fuzz-y Math: Has the Sheriff Made the Case for the Public Safety Millage? The funding issue was raised repeatedly during both the primary and general elections in the 2012 sheriff race. While opinions vary on the need for additional financial support at the sheriff’s office, a fact remains clear: as candidate for sheriff, Ted Schendel on multiple occasions, notably during the final campaign forum held by the League of Women Voters, adamantly stated his opposition to a public safety millage. Schendel was quick to remind everyone a millage amounted to nothing more than a tax increase. So why the change of heart? In an October 23 letter to the Record-Patriot, Sheriff Schendel wrote that after working with the county commissioners to consider “many options” to resolve the department’s financial challenges, he decided he had only two choices to provide 24-hour coverage to the county: a millage, or “(2) Sue the County for not adequately funding the Sheriff’s Office.” No breakdown of those considered and rejected options was provided, if only so we might understand what sorts of priorities we have as a county. Could funding have been found some other way? If not, why not? What we have in the paper from Schendel is a threat: “Keep Benzie Safe” by voting yes on this millage, or get sued. Is the situation this dire? Has there been a crime surge since the election? When compared with other counties of similar size, is Benzie County understaffed with law enforcement personnel? These are important questions that should be answered before county residents vote to approve what amounts to a 60% budget increase for county law enforcement, which would place approximately $1.6 million under the direct control of the sheriff. The county currently pays approximately $1 million out of the general fund to provide for law enforcement functions, namely road patrol, while jail operations are financed by both the jail millage and the general fund. If approved, the four-year public safety millage will finance all law enforcement functions of the sheriff’s office. Sheriff Schendel says the new millage will provide enough revenue to allow 24-7 road patrol by two deputies, a school liaison officer, new patrol vehicles, and a full-time secretary in the detective bureau. The jail millage will be eliminated and the operation of the county jail will be paid exclusively out of the general fund. Advocates of the new millage argue that the jail should be fully paid out of the general fund anyway, as maintaining a jail is one of the services the county is required to provide according to the state constitution—road patrol is not a required service. With the .9 mill jail millage gone, the 1.5 mill public safety funding amounts to a tax increase of .6 mills (or roughly an additional $60 a year for four years for a $200,000 house). Dennis Rodzik: Could I see some crime stats for the past 5 years to justify a increase in taxes?????? Benzie Citizens for Public Safety Dennis, there was a 23.52% increase in felonies between 2009 & 2012 in Benzie County. The Sheriff’s Office has all that information on file and would be happy to provide you a copy (231-882-4484). The central point of the millage is access to service and the gain that Benzie County would have from 24 hour road patrol. Passing the millage will also ensure that we have the same hours of coverage that all of the surrounding counties enjoy. Felonies apparently went up in the four years between 2009 and 2012, but you wouldn’t know that (or any reasons for it) from the millage campaign. Instead of claiming that a higher crime rate justifies increased expenditures, advocates of the millage rely on a vague threat of some crime-ridden future, and the idea that Benzie “deserves” 24-hour police protection just like all the surrounding counties. In addition, a strained connection is being made in the millage campaign between economic development and law enforcement protection. Those who are for the millage contend that business owners and entrepreneurs must “feel safe” before they will invest in the county. How many businesses are sitting on Benzie’s borders, wringing their hands, waiting to see whether we pass this millage or not? The campaign doesn’t tell us. A better question, also unanswered, would be: Have any businesses actually left because they felt unsafe? In the March 27 edition of the Traverse City Record-Eagle, Sheriff Schendel was quoted saying that in a county the size of Benzie the appropriate number of road deputies is 36. But according to the Bureau of Justice Statistics, the same agency cited by the sheriff in support of his claim, in 2007 sheriff’s offices in counties roughly the size of Benzie employ on average about 14 sworn police officers. * Per the 2012-2013 Benzie County budget, we had 13 sworn officers in our Sheriff’s Office. That number includes road deputies, sergeants, secondary road patrol, undersheriff and sheriff. It does not include the recent hiring of a ninth road patrolman. With that addition, we now have 14 sworn officers. The sheriff is asking for a funding increase so he can hire four or five more road patrolmen. This will bring the total number of sworn officers to 18 or 19. By national standards, in terms of population, we are on par at our current staff levels. Could those 14 officers be rescheduled to cover 24 hours? Do more officers mean less crime? The campaign hasn’t made that case, and the facts from other localities don’t bear it out. For example, on a per capita basis, the city of Detroit has more than 5 times the number of police officers (Detroit Police, Wayne County Sheriff’s Office, Michigan State Police, FBI, and ICE) as Benzie County has and it had more murders last year than at any point in the last 40 years. The correlation between more police officers and less crime has not been substantiated. Your vote on this millage may come down to whether you feel the need for more, and more frequent, police coverage. But there’s an additional factor to take into consideration: Placing the Sheriff Department’s entire budget under a millage, as this measure does, means that every four years we’ll have a referendum on whether or not to fund the Sheriff’s office at all. In 2017, the next sheriff will have to spend time and energy fighting for 100% of the budget within the first year of his or her term. By putting the entire budget of the sheriff’s office on a millage, the sheriff’s office is running the risk of not having a budget in the future, putting the careers of every single employee at the sheriff’s office up for grabs. The public safety millage is a sort of extortion against the voter: either approve all of it, every four years, or get no Sheriff services at all. That shouldn’t be the choice given to the voters. The sheriff’s office can be funded up to at least a minimum level by the general fund sufficient to allow the sheriff to perform his basic duties. If the current fleet of patrol vehicles is inadequate, if reinstating a resource officer at the schools will promote a good relationship between youth and the law, if Elberta residents on either side of the beach-driving issue will have their enjoyment of the beach affected by 24-7 patrol,** let’s hear the case for those items on the Sheriff’s wish list. If there is a need or demand for any of these items, why not put them to the voters as separate issues? As it stands, a yes vote on this prix-fixe millage sets us up for a tax increase now and a possible case of severe indigestion in 2017. * There were 862 sheriff’s offices in the United States that served populations between 10,000 and 24,999. The total number of sworn officers employed by those agencies was 12,167. ** Regarding patrol for Elberta Beach, Sheriff Schendel did propose last year that Elberta could pay a special contract fee to ensure increased patrol of the beach. The Benzie County Board of Commissioners met in a regular meeting on Tuesday, September 3, 2013, at 448 Court Place, Beulah, Michigan. County’s Development Plans for Point Betsie—What’s Going On? The future of historic and scenic Point Betsie is in jeopardy. This unique and beautiful piece of “pure Michigan” has been treasured by Benzie County residents and summer visitors alike for decades. Now, the county, through its Parks and Recreation Commission, has begun consideration of possible future development of the end of Point Betsie Road. This development could include a large expansion of unneeded parking space using the end of Lake Michigan Road as a model. The small road end at Point Betsie cannot support such an expansion. Such development would bring devastating and possibly irreversible environmental and ecological consequences for years to come. While perhaps well intended, these discussions are ill-conceived and threaten to destroy the very essence of why people want to visit Point Betsie in the first place. The Point Betsie Lighthouse compound itself has been wonderfully preserved and restored, with the support of Benzie County, through the tireless work and financial support of the Friends of the Point Betsie Lighthouse and its hundreds, if not thousands, of volunteers and supporters (including grants intended to protect the area) since its transfer to Benzie County in 2004. Likewise, the surrounding sand dunes, interdunal wetlands, boreal forests and sandy Lake Michigan beaches were preserved, initially, through a gift of 71 acres of land to The Nature Conservancy in 1988 and added to since then by others who value the unspoiled natural habitat, landscapes and sunsets which are enjoyed year after year by locals and visitors alike. Already, the small public beach and the surrounding area are showing signs of the inevitable wear and tear of too much public pressure on this very small space. To subject this fragile and precious natural resource to any unneeded and unwarranted over-development would be a grave mistake by the Parks and Recreation Commission and county commissioners. County Recycling Coordinator Mike Fiebing was pulled over in his personal vehicle on Wednesday June 5 for having a cracked windshield—a routine traffic stop, according to Sheriff Ted Schendel. Schendel told the Alert that when the officer ran Fiebing’s license record the license was found to have been suspended, and the record showed that it had been suspended more than once. Fiebing was arrested and taken to jail; he posted bond, and the case was referred to the prosecutor. The arraignment was Thursday June 13 at 9 am. “Having an employee driving a county vehicle without a valid license places a huge liability on the county,” the Sheriff told the Alert that morning. The question is whether Fiebing had been knowingly operating the county vehicle with a suspended license.